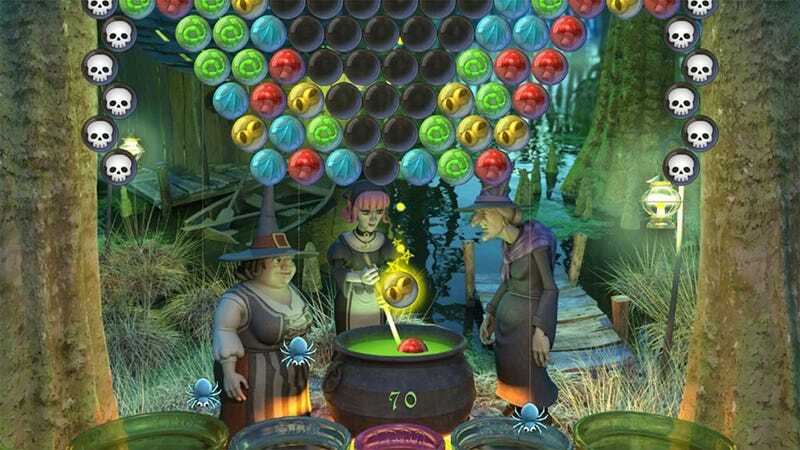 Today players of King.com's popular Bubble Witch Saga can continue their Facebook-based quest on the iPhone and iPad. To some a free-to-play puzzle game that seamlessly synchronizes between Facebook and smartphone might not sound like that big of a deal. To others it's another step on the path towards a future of platform-free gaming. Nearly everyone that plays social games uses Facebook. A large portion of those people own smart phones capable of playing the same sort of games. Why not marry the two? Zygna tried it with FarmVille, but shoddy implementation soured the experience from the start — the FarmVille iOS app is going offline August 1. But King.com picks up the torch and runs it with today's launch of Bubble Witch Saga for iOS. The free-to-play Bust-a-Move meets Peggle puzzler that became so popular Zynga copied it (a sure sign of making it big) can now be played on Facebook or via the app, with progress synchronizing fluidly between the two platforms. One would think such a thing would be much more common. Give it time. "As consumers and the industry focus more on games for mobile devices, launching a truly cross-platform Facebook game has been a top priority for King.com," said Riccardo Zacconi, CEO, King.com via official announcement. "We're excited to be the pioneers in making this available for our players. Gamers can play signed in or not and progress either way, enabling them to experience the excitement of Bubble Witch Saga whenever and wherever they wish, without losing their place in the game." Social gaming is dominated by titles that aren't particularly demanding on electronic equipment, with simple mechanics aimed at the more casual masses, and while more traditional console and PC gamers often scoff at the lightness of it all, there aren't upwards of 19 million people playing Gears of War every month. Social game developers don't have to worry about console install bases. They put their games anywhere people will play them, which seems like a sound strategy, and will eventually lead to a casual game market where it doesn't matter what platform you're playing on; you're just playing. Look for the Android version of Bubble Witch Saga later this year. I did say eventually.